I just used computer printer paper, but I could get a lot more delicate cuts if the paper was thinner, tissue paper is great. Wouldn’t this be a great thing to make on a much larger scale and use as the center of a quilt, similar to a traditional Hawaiian quilt. I think I need to get some really big paper! This entry was posted in ETC, Quilts and tagged paper snowflake, Quilts, snowflake making. Oh great, now another thing to make!! Now I have to go find some nifty paper to use and start cutting…….. I have been planning to try this concept on a large scale for a bed quilt, even have the batiks in my stash, just never got up the nerve to work on it. It may be my challenge for next winter. Somehow really big snowflakes seem more appropriate to this snowy northern location than all the tropical fauna in a tradtional Hawaiian quilt. after you trace them you put them in a manila folder and send them to me! wow! 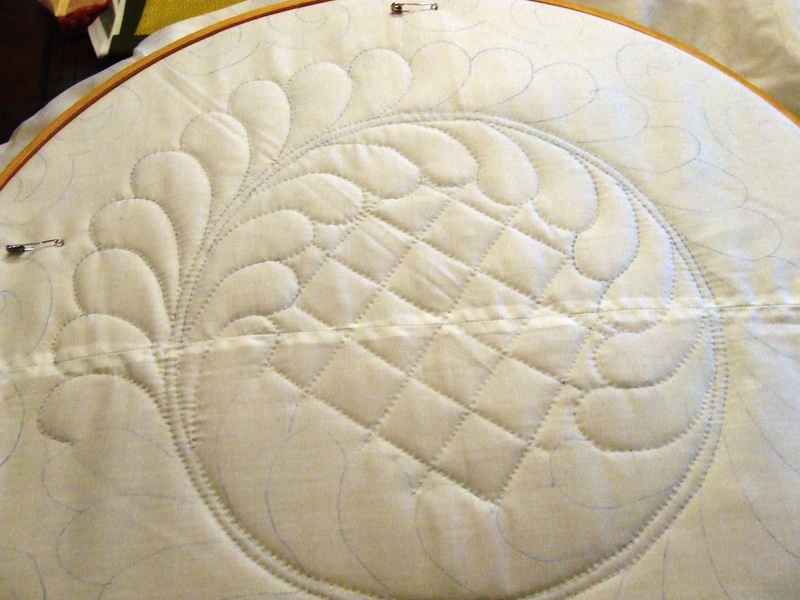 the quilt I am working on now will be hand quilted and oh the empty space would look great with snowflakes quilted in them! Wow that is amazing!! Thanks for showing how to make the snowflake. Thanks, my big paladium window is going to get decorated! 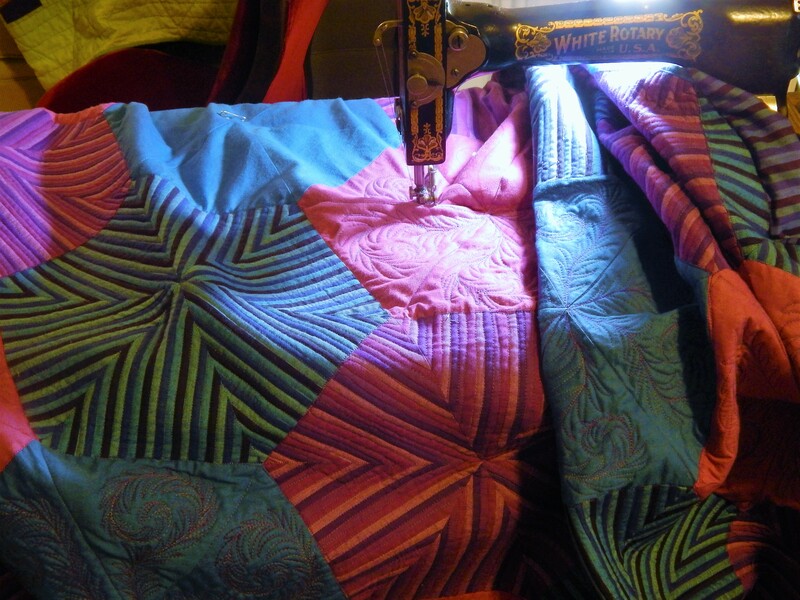 I agree about them making great quilting designs, now where can I get a large roll of freezer paper. You can easily make freezer paper larger by cutting strips of freezer paper to use as tape to hold the pieces together. Ricky Tims does this. Oh brother Tim. I am obviously incapable of making a snowflake. I only got to the hard part of the step and can’t get my paper to match your picture. lol Back to hand quilting for me. I read a book about Hawaiian (sp?) Quilts this summer, called The Aloha Quilt by Jennifer Chiaverini. 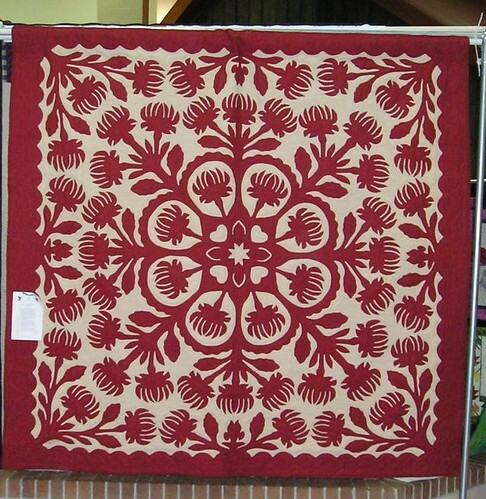 (She has written a series of books on quilts and quilters) There was a lot of interesting background on Hawaiian Quilts, which I have always admired. 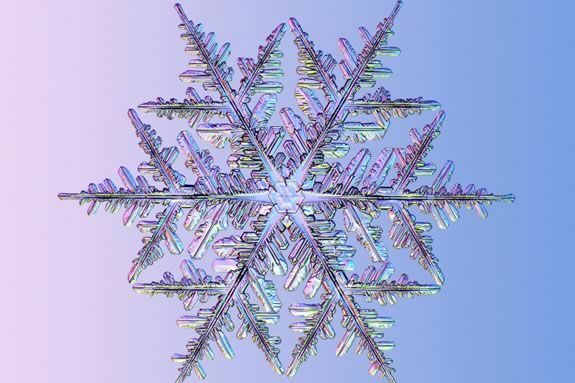 I will have to try to make a snowflake now! The book talks a lot about all that. It was so interesting! Each pattern is unique, and has a lot of meaning for the designer. And a gift of one of those quilts or the pattern for one, is very significant. 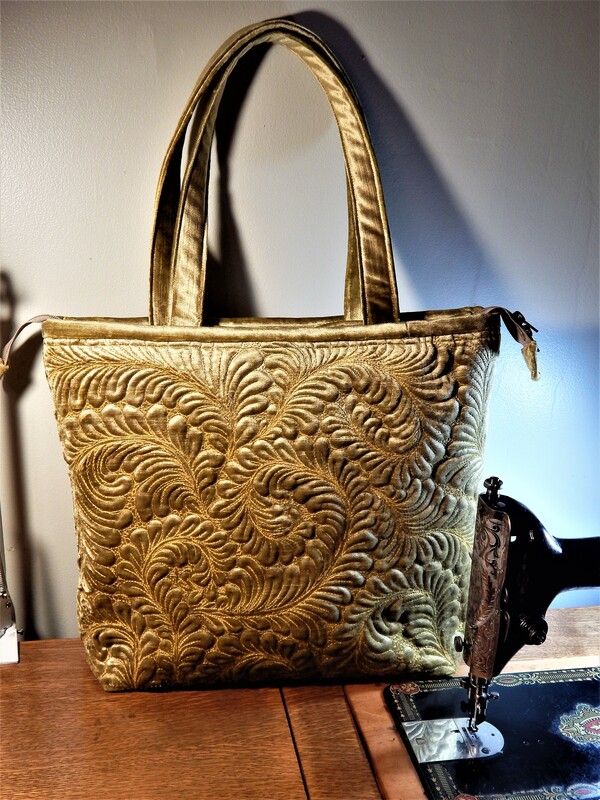 I can understand your hesitation about the applique. But you could read the book for a warm-up, haha! I just ran across your snowflake tonight. I was thinking instead of trying to make a giant snowflake to use for a quilt, why not just make several smaller ones for the quilt. You must be revisiting this idea since you posted the directions for the snowflake. Thank you for that, I’m going to try this and play with it… thinking wool center piece. Seems like it would be easier than making all these animals I have worked on and stitching them onto a circle. LOL! Does this fold work for the reindeer one also? You have an amazing talent, not with just the designing, folding, and cutting of these snowflakes, but also with the creative mind that conjures up these unique ideas. 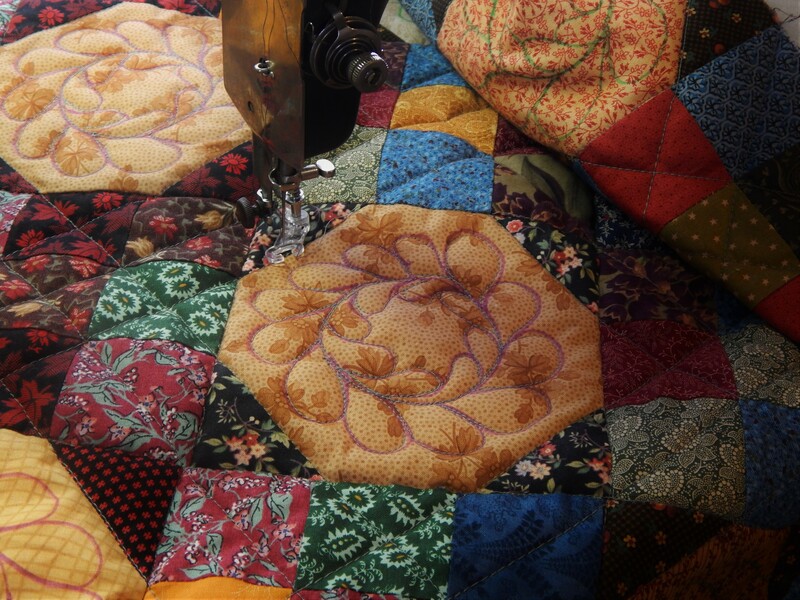 Of course the quilts are astounding! I envy your creativity! I would like to try this. Can you recommend a particular type/style of scissors? Is smaller better? Are they called something special? I use embroidery scissors….they are small and have a point.